Discussion: Experience the fresh taste of clean as extra strength, oxygen-releasing molecules make your mouth come alive. Zesty essential flavors of eucalyptus, thyme, menthol and wintergreen help power fresh breath. Potent xylitol, grapefruit seed extract, and hydrogen peroxide's unique bubbling action will make your mouth feel super clean. 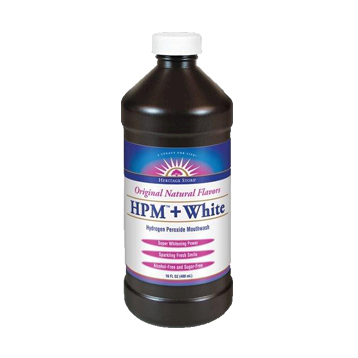 Swish with HPM + White for a sparkling smile! Ingredients: Filtered Water, Hydrogen Peroxide, Xylitol, Citrus Grandis (Grapefruit) Seed Extract, Thymus Serphyllum (White Thyme) Leaf Oil, Eucalyptol (Eucalyptus), Menthol, Natural Wintergreen Flavor. Directions: Swish 2 tsp of HPM + White for at least one minute and expel. Use up to 4 times daily after meals and at bedtime, or as directed by a health professional. Children under 12: use only under supervision. Under 2 years: use only under supervision of a qualified professional. Caution: Do not swallow! If irritation, pain or redness occurs, consult a doctor or dentist promptly. Avoid contact with eyes. Use only as directed. Keep out of reach of children.